My word for 2018 was adequate. It’s the best word to invoke the exact response from people that requires you to work on it. Allow me to demonstrate. Anyone Else: Adequate! That’s a terrible word. It should be something better than that! Me: Or maybe it’s adequate. The truth is that I completely forgot this was my word of the year until recently. I was reflecting on 2018 and I realized it was a mediocre year. I was mediocre in my work, in my parenting, in my marriage, and life in general. I didn’t try to be anything more than I had to be. I tried just being for a year. Some might say it was adequate. In reflection, I noticed another interesting thing. In adequacy, I learned to let go of a lot of the beliefs I was holding onto. In my lack of busy-ness, in my lack of breaking down barriers, in my lack of shattering glass ceilings, there was a lot of space for me to see the way I was interacting with the world. I think this is the first time in my life I have had a mediocre year. Actually, in seventh grade I phoned it in for a year. But middle school is brutal and I did not like the attention I was getting as mediocre so I quickly did a 180. In recent therapy sessions I discovered I was the hero child in my family. I was the kid that came to the rescue even though no one asked me to. I am certain I have been living into the hero role into adulthood. In some ways this is just who I am, I am a helper. In some ways, this is a tactic to keep me in the good graces of others. In some ways this is a way for me having to avoid standing in my own sense of worth. The past seven years for me have included the pregnancy, birth, and breastfeeding of three children (full stop. if I had done nothing else that would have been plenty). They have included two job changes and the starting of a business. They have included an unraveling, re-centering, and messy growth of my marriage. They included a summer with a foster child. They included hosting a family member in our house for two months while she cam back from the brink of depression. They included showing up for my own daughter’s mental health journey. To be clear, none of those things were over-achieving. Those were the things that I wanted to show up for. Now imagine a million tiny other over-functionings in the midst of these things over the course of seven years. Here is the point I want to make for today, in my year of adequacy, I didn’t set out to take my foot off the pedal. I set out to be adequate and that resulted in me looking up for the day and saying, “This is enough. I am enough. No more will get done.” Unintentionally, in that, I learned so much about myself. I learned how to separate the needs of others from my responsibility. I learned how to stop managing other people for my comfort. I learned how to be helpful without being the hero. I came to realize that when you are always the hero, people have no idea when you need help – and it’s important that other people can see when you need help since we are not always good at asking for it. I learned to listen to the voice inside of myself that reminds me when I have over done it. Oh, and I made and reconnected with really good friends!!! The BEST FRIENDS. Most importantly, I was adequate. Nothing more, nothing less. 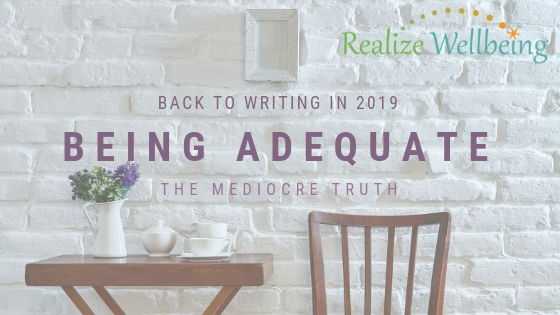 Being adequate was hard for me. I had many messy moments feeling like if I had just done more last week I wouldn’t be in a tight spot this week. I had to face and continue to face those that really liked me for my hero status. In 2019 I will continue to be adequate. You can love me for me.